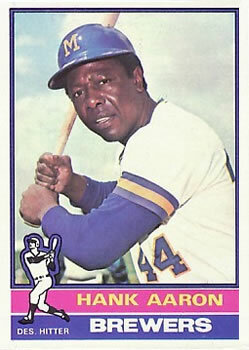 Aaron was in his first year with the Brewers after an offseason trade from the Atlanta Braves, with whom he had enjoyed 21 stellar seasons. At 41, his best years were behind him, but he wanted to end his major-league career in the city where it began. And being in the American League, he could stay in the lineup as a designated hitter and not worry about having to play in the field. He was showing his age, however, as he was adjusting to a new league and new pitchers, and was hitting only .157 going into the game. The standings in the American League East on May 1 told a rather different story from how matters would unfold. The Brewers, 9-7, were one game behind the 10-6 Detroit Tigers, as the teams met in the second of a two-game series. The eventual division champion Boston Red Sox were three games back with a 7-9 record. Milwaukee had defeated Detroit 6-2 the previous night behind Jim Slaton’s 7⅓ innings of five-hit pitching. The first inning belied what was to come as Detroit took an early 2-0 lead when Gary Sutherland singled and then scored on a two-run homer by Aaron’s DH counterpart, Willie Horton. Milwaukee cut that lead in half in the bottom of the second with some light strokes from heavy hitters. George “Boomer” Scott, who would lead the American League in home runs, RBIs, and total bases (36, 109, 318), singled and moved to second on Aaron’s base hit. After Ruhle walked Darrell Porter to load the bases, Scott scored on a sacrifice fly by Mike Hegan. Aaron got his historic RBI in the third. Don Money singled with one out, but was forced at second on a grounder by Robin Yount. Sixto Lezcano singled to move Yount to second, and the 19-year-old shortstop then scored on Scott’s single. Next, Aaron made history with the Brewers’ third consecutive base hit, driving Lezcano home and giving Milwaukee a 3-2 lead. The Tigers continued trying to make a game of it in the fifth. With two out, speedster Ron LeFlore walked, stole second, and advanced to third when Brewers catcher Porter became the latest in a long line of backstops who made throwing errors trying to gun LeFlore down at second. Horton singled to score Leflore and tie the game, 3-3. Milwaukee took control of the game for good with five runs in the bottom of the inning. Money led off with a single off eventual losing pitcher Ray Bare and scored quickly on Yount’s double. Two outs later, Aaron began his effort to make his RBI record unbreakable by driving Yount home with a two-bagger of his own. Porter made up for his error by tripling in Aaron, and then scoring on an error by second baseman Sutherland, who was trying to cut Porter down at third. (Detroit committed four errors in the game while Milwaukee made three.) Hegan got in on the scoring fun by walking, stealing second, and then crossing the plate when Pedro Garcia blasted a triple of his own. The Brewers led, 8-3. The only thing better than scoring five runs in one inning is scoring five runs in another one, and that’s exactly what the Brewers did in the seventh. Aaron led off with a single — even he couldn’t drive in a run if he was the first batter in the inning — after which manager and former teammate Del Crandall removed him from the game after a 4-for-4 performance for pinch-runner Bobby Mitchell. Pitcher Tom Makowski’s error on a ball hit back to the mound allowed Porter to reach and Mitchell to advance to second; both moved up on Rob Ellis’s sacrifice (Ellis replaced Hegan in left field in the sixth). Garcia’s fly ball scored Mitchell and moved Porter up to third. Bob Coluccio walked and, with runners on first and third, Money singled to score Porter. At this point, the Brewers had hit singles, doubles, and triples, but were a home run away from a team cycle for the game. Yount took care of that with a three-run shot that scored Coluccio and Money ahead of him. After seven, it was a 13-3 laugher for Milwaukee. The Brewers had one more turn at bat in the eighth, and they clearly didn’t want to be greedy, so they only scored four runs. Mitchell walked and came home on Porter’s home run, after which the Brewers loaded the bases on a Garcia walk sandwiched between singles by Ellis and Coluccio. Kurt Bevacqua, pinch-hitting for Money, hit a sacrifice fly that drove Ellis home. Garcia closed out the scoring when he crossed the plate on an error by shortstop Tom Veryzer. The final score was Milwaukee 17, Detroit 3. By winning the game, Milwaukee tied Detroit for first place in the American League East, but neither club would enjoy its lofty status for long, as they plummeted to the two worst records in the American League. The Brewers finished with a 68-94 mark while Detroit was a horrendous 57-102. 1 Aaron already had 40 home runs by the time Yount was born. 3 Lou Chapman, “‘No More Plateaus,’ Says King Henry,” The Sporting News, May 17, 1975. 4 Dale Hofmann, “RBI Record No Big Deal For Aaron,” Milwaukee Sentinel,” May 2, 1975. 5 Mike O’ Brien, “Aaron, Young spark Brewers past Tigers 17-3,” Post-Crescent (Appleton, Wisconsin). 6 Chapman, “Hank’s Record Turns Mates On,” Milwaukee Sentinel, May 2, 1975.